Activities throughout the units encourage students to actively participate and learn, improving retention and increasing interaction. 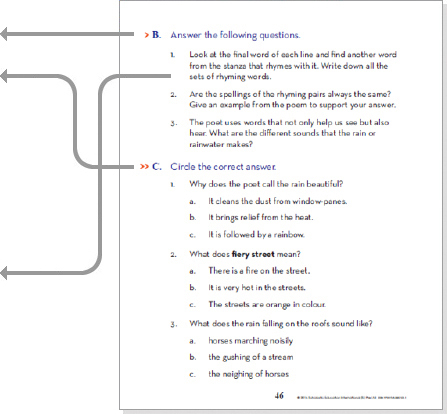 Before Reading questions are intended to check prior knowledge and help students identify with the theme. 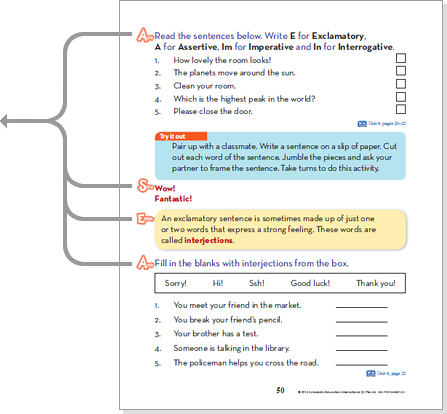 While Reading questions increase student engagement and focus on evaluating on-going development during the lesson. Difficult words highlighted and explained on the same page. 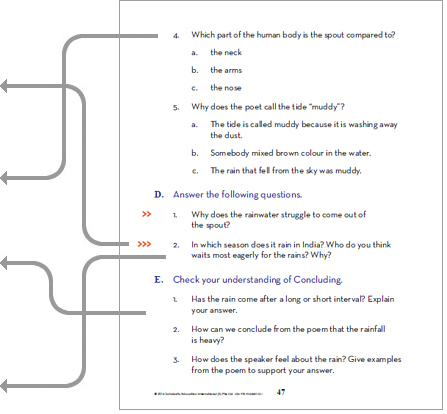 After reading questions encourage students to think about and summarise the lesson. They also capture the child’s emotional response to the text explored. The last question is always strategy-based, one that tests the child’s Higher Order Thinking Skills (HOTS). Carefully crafted questions to develop comprehension skills such as finding similarities and differences, reading for information, inferring, sequencing, etc. Questions are consciously kept open-ended. This ensures that children are free to come up with differing answers, and the focus is on building comprehension skills. The Vocabulary section follows the Reading Comprehension. 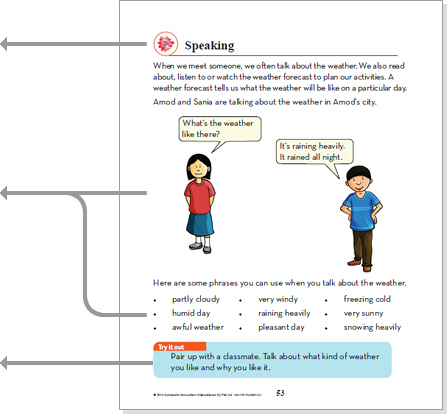 In this sections words and expressions that the student will eventually use in writing, speaking and in comprehending are introduced and explained. 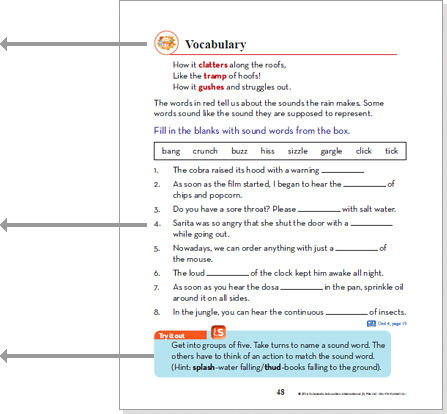 Various exercises are provided to test the understanding and application of vocabulary taught to the student in the unit. This ensures that children are free to come up with differing answers, and the focus is on building comprehension skills. Activities are provided for the students to use the words in focus or expressions in an interactive manner, thus reinforcing learning. Vocabulary section is followed by Grammar Section. 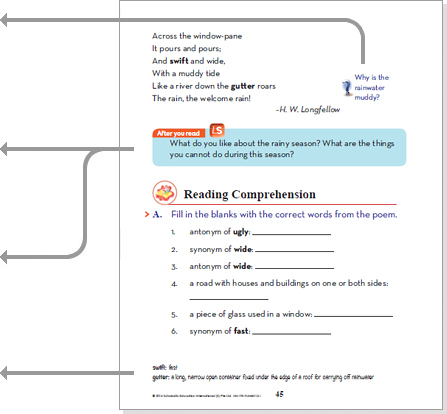 Concepts in this section are introduced systematically in spiral progression with examples from the text. The language used is simple and the explanations are easy to follow. 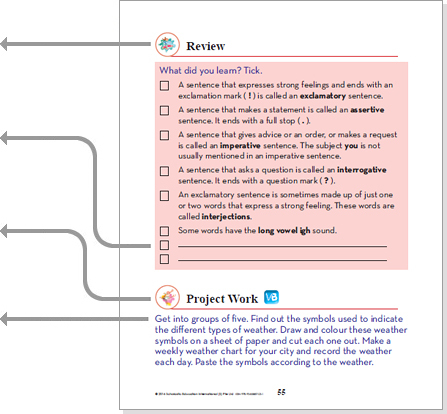 Show-Explain-Apply has been used to teach Grammar as well as Punctuation. Clear and numerous examples give students a strong understanding of the mechanics of language and lay a strong foundation for good English. 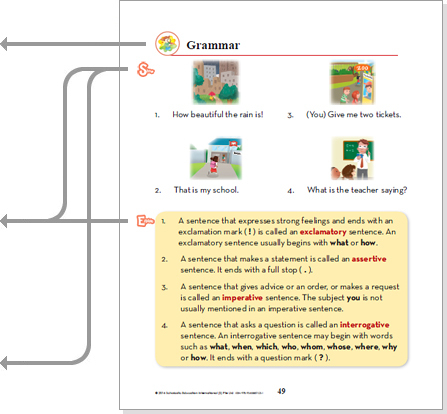 The Show-Explain-Apply methodology is used to teach grammar as well as vocabulary. The Spelling section follows the Grammar section. Spelling rules are taught based on phonics. We have a variety of exercises to engage students’attention. 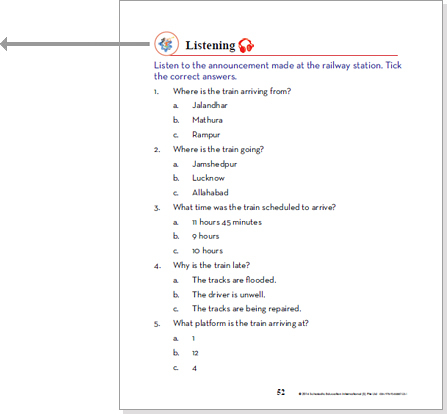 The next section focuses on Listening skills. The tasks included are related to the theme, vocabulary or grammar exercises and help to improve the listening skills of the students. The next section focuses on Speaking skills. 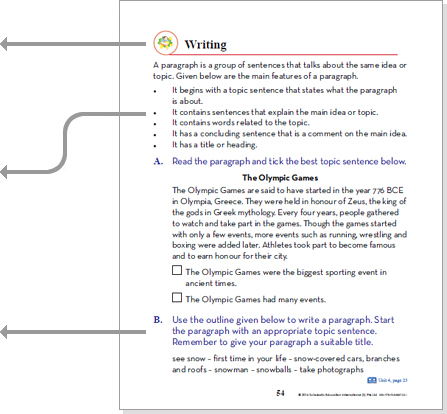 Examples of speaking activity linked to the theme are provided for the students. This helps them to model their initial dialogues on them and take off from there. 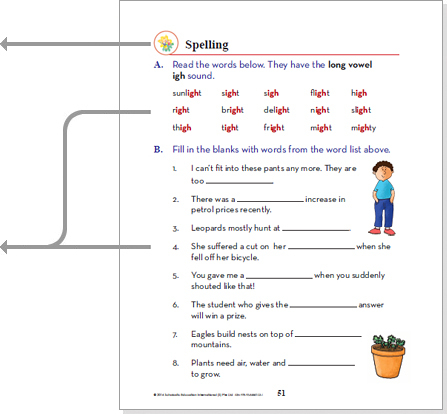 The students learn sentence structures in the classroom and develop speaking skills through practice. They can then use them in real-life, out-of-classroom situations and in similar contexts. 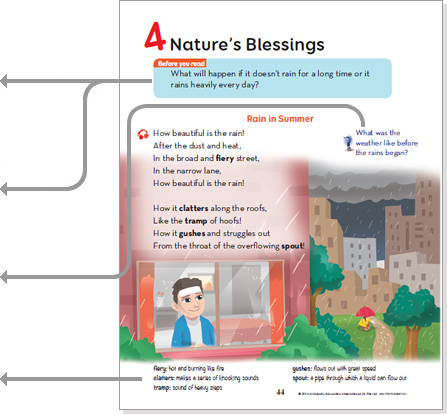 The Writing section that follows develops the child’s writing skills using a variety of text types. Writing exercises are scaffolded. They slowly build up writing skills in spiral progression, as well as consolidate what the child had learnt in earlier sections of the same lesson. The writing tasks familiarise students with the techniques of writing. Many of these use familiar contexts and are set in real-life situations such as filling up a form, taking down messages, making a poster, etc. The Review Section reiterates the learning objectives of the lesson, and also provides assessment as the child needs to tick the boxes as they apply. Children’s understanding is further assessed using the blank spaces provided for children to fill in anything else they learnt. The last section in every lesson is Project Work. These are activities that are either Value Based or teach Life Skills. These activities encourage pair or group work, reinforce the thematic takeaway from the lesson, and are achievable within the time frame of the class and using the available resources.